Hostel 1W kohteessa Rijeka, Kroatia: Varaa nyt! 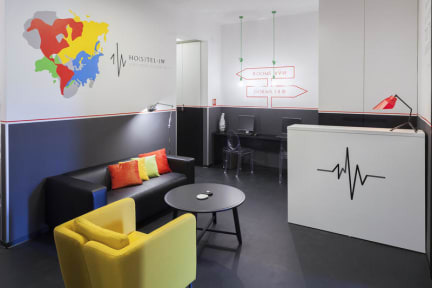 Hostel 1W is a cross between a hotel and a hostel, and provides designer accommodation at budget prices. The hostel name 1W is an abbreviation for One World, because the hostel presents a little world where people meet from all the parts of the world and their heart beats as one,no matter their religion, culture or sexual orientation. We believe in One World. The hostel is located on the second floor of a building from the early twentieth century. It is easy to reach and visible from the adjacent square - Jadranski trg. The hostel is located in an old building, therefore it is not accessible for disabled guests. Property facilities: cable TV, common room, free city maps, kitchen, linen included, lockers, reading light, safe deposit box, travel desk, towels included, 24 hour security, air conditioning, cafe, free internet access, free WiFi, hairdryers, hot showers, house keeping, internet access, tea&coffee making facilities. In the heart of Rijeka, our hostel is located only 20 metres away from the town’s main pedestrian zone the Korzo. It is only couple of minutes walk from big shopping centers, shops and restaurants with local food. There are also lots of attractions close by like: St.Vitus Cathedral, the city tower and city gate, the croatian national theatre 'Ivan Zajc', the Korzo 'fountain', 'Trsat' castle and many moreHostel 1W is 300m from the bus station and only 10 min walking from the rail way station. The closest Airport is ubicate only half an hour away in the island of Krk. Our dorms have individual themes/names. We offer dormitories in various sizes. One is a beautiful designer room that represents the continent of North America, on each bed are available: blackout curtains, electric socket, courtesy light. there is also a make u corner exlusive for female use. Then we have a mixed dorm which is a comfortable designer room that represents the continent of Asia, on each bed are available: blackout curtains, electric socket, courtesy light. this room provide a charming. And another mixed dorm that represents the continenete Australia, on each bed are available: blackout curtains, electric socket, courtesy light. Taxes not included - tourist tax 10.00 HRK (1 Euro) per person per night. The reception is open from 9:00 - 21:00. The hostel is located on the second floor of a building from the early twentieth century. It is easy to reach and visible from the adjacent square - Jadranski trg. Had a great time there, location was perfect and the room very spacious and stylish. We also took part to a day trip organized by the hostel and we'd a blast! Rijeka was a nice destination also, not too crowded but yet there were enough things to do and see.